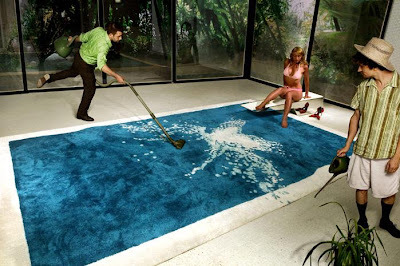 Swimming Pool Rug: Modern rug, titled "Grand Grand Splatch" by Puspam. 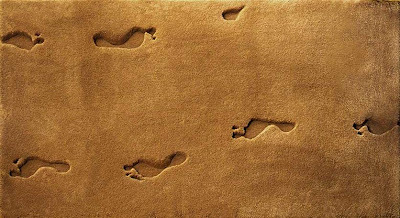 Glow Rug: "The carpet shines in the form of feet after every twist you make on it." 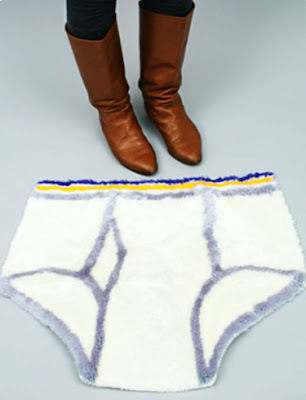 Undy Rug: "This is one pair of knickers that actually belongs on your floor!" 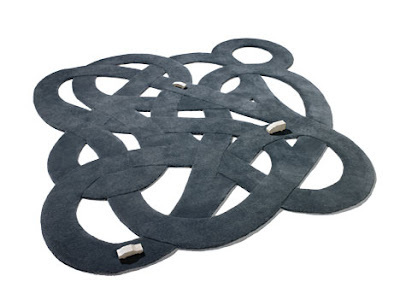 Snake Rug: "A handknotted snake shaped rug, hides a cable that heats up, warming a cold floor. 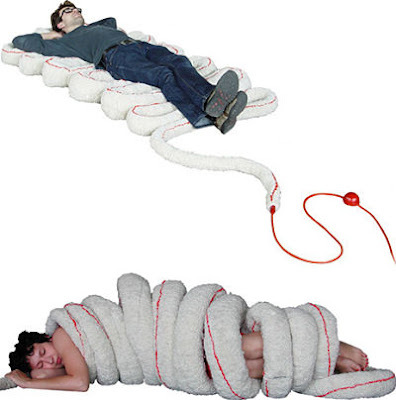 Buttons on the side make it possible to fix the snake in different positions." 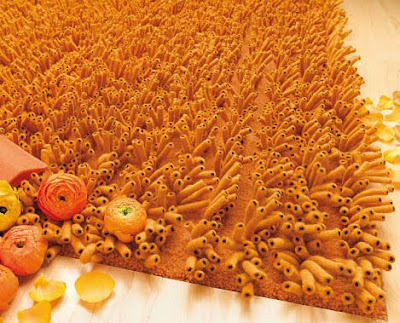 Little Field Of Flowers: "These flower shaped pieces of felt gives this carpet a beautiful appearance. 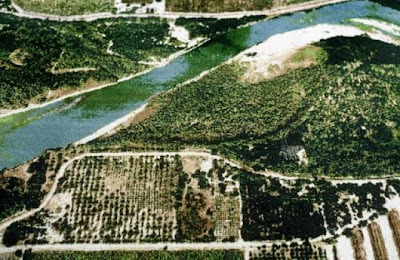 Its surface is full of constant movement and volume." 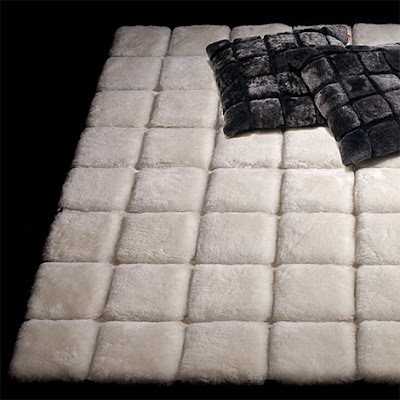 The Golden Collection: Rugs that make you giggle; these hand-tufted rugs from New Zealand wool made by D Golden are sure to make a bold statement on any floor. 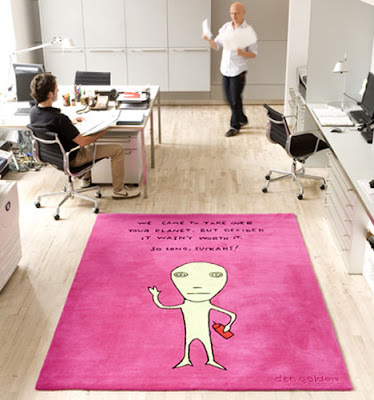 OOOMS design's Carpet: "It's a continues struggle between attraction and repulsion. It's a warm, soft, cuddly carpet that attracts you to take a nap on it. 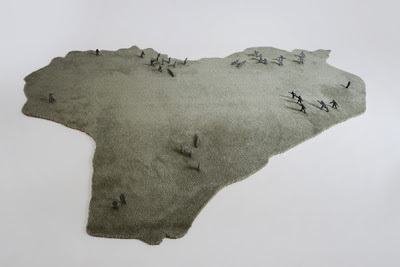 But at the same time its a repulsive image of a car-flattened, …..."
Dialogue Carpet by Ane Lykke: "Dialogue is a large-scale carpet that questions the conventional and functionality of a carpet. 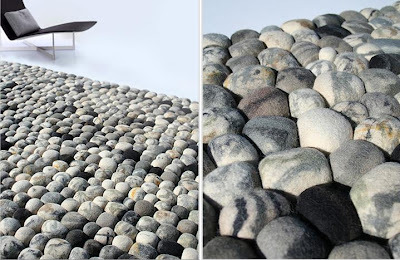 A carpet in paper yarn that transform from a two-dimensional to a three-dimensional object that can be shaped and modeled in a endless number of variations." 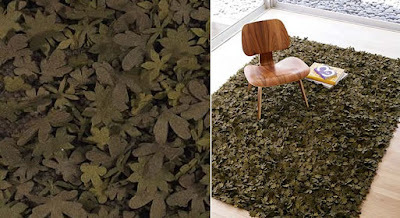 Forest Roll Rug: Designed by Aguiniga Design, "this innovative foresty goodness folds up nicely when not in use." 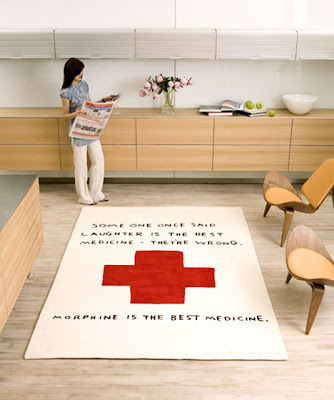 Creative Rugs by Madeleine and Dudley: Modern rug designs by creative artists Madeleine & Dudley. 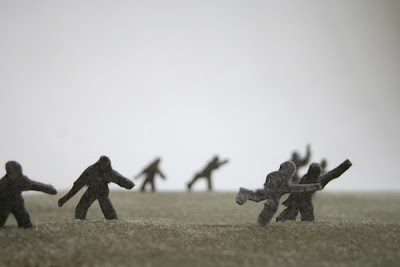 Contemporary Wool Rug from Anstoetz: "The long tubular fingers reach up as if growing from a dense pile of fine wool"
Miles Rug: The "miles' Rug was inspired by watching children play, designed by Big Game. It comes with three wooden toy cars! 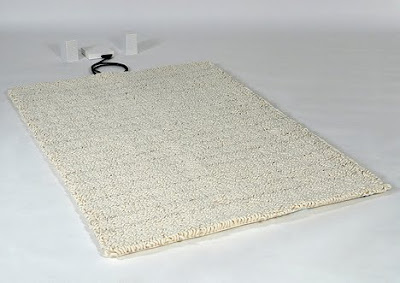 Human Antenna Carpet: "This carpet is made of looms from conductive thread. 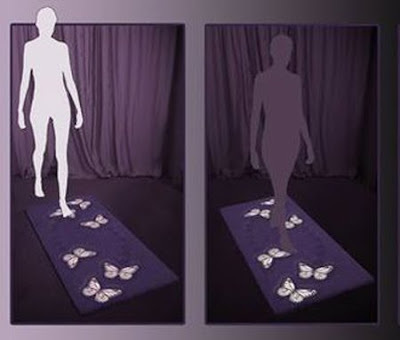 As you can imagine, it acts something like a Dance Dance pad in that your body does the talking." 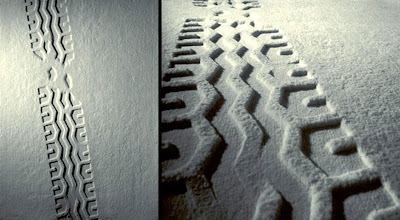 Snowflake Rug: "The rug design is made from weaving various transparent fibers together, the design suggests a crystallized snowscape." 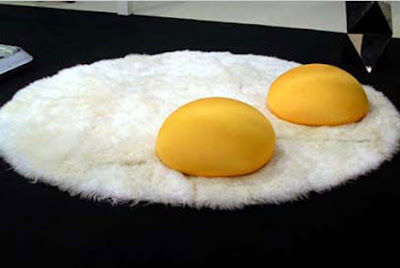 Breakfast Rug: Creation of designer Valentina Audrito. 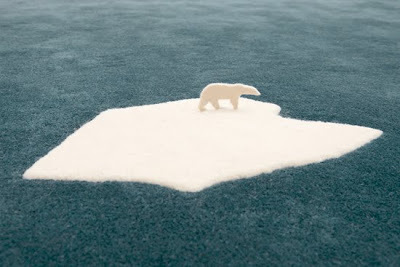 Polar Bear Rug: NEL uses the age-old tradition of using rugs as a means for communication and a cultural record to convey its message. 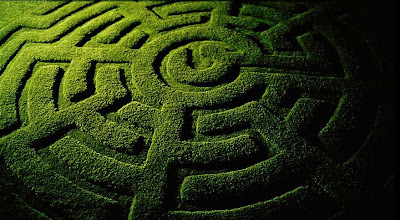 Carpenter's Rug: This rug is a concept design by Carpenter that draws it's inspiration from the classic chalk outline in movie scenes. 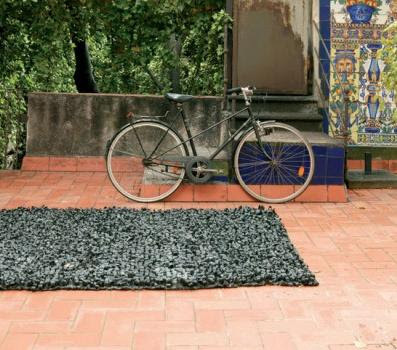 Bicycle Tires Rug: The Bicicleta Rug from Nani Marquina made out of recycled bicycle tires. Do-Lo-Rez Collection: Designed by Ron Arad, is a combination of two expertly made pieces into one single element. The two pieces can be fitted together vertically or horizontally, allowing unlimited patchwork creation. 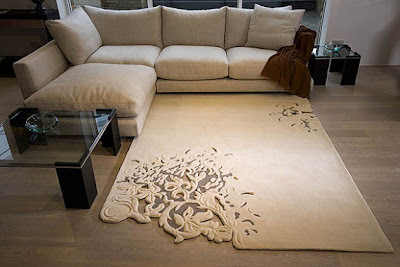 Seagrass Rug: It's a beautiful combination of traditional and contemporary. 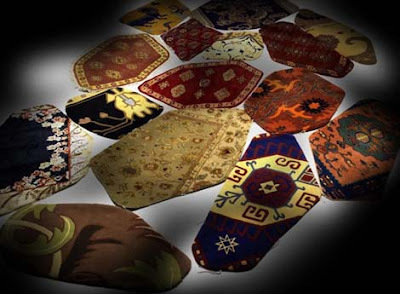 Each rug is intricately handmade using a hand loomed technique. 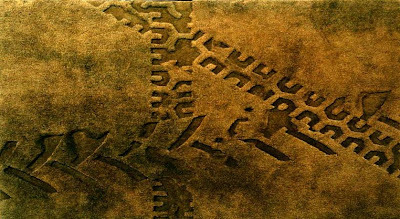 Cuks Rug: It's an interesting deviation from monochromatic floor ideas; its full of life and presents a unique graphic cover for your floor. 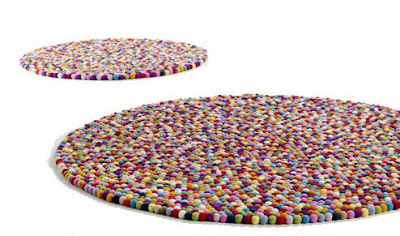 Topissimo Rug: Its inspired from polka dots with beautiful color and texture. 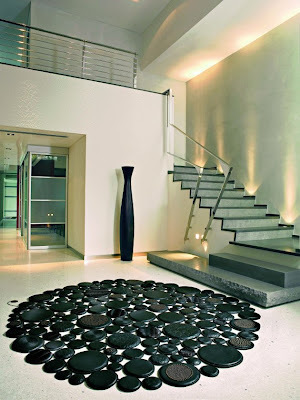 Roses Rug: Beautiful roses rug designed by Nani Marquina. Top Floor Ethereal Rug: "An organic floral pattern reaches into the whitespace on this rug, yet this pattern is more than grooves and layers. Designer Esti Barnes has cut these layers right through the rug itself, exposing the bare wood below." 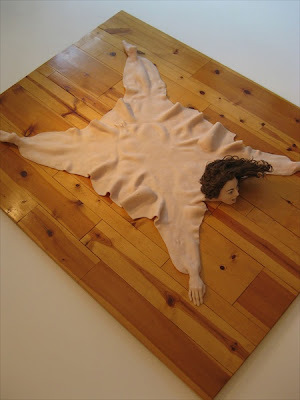 Human Skin Rug: Creation of artist Chrissy Conant. 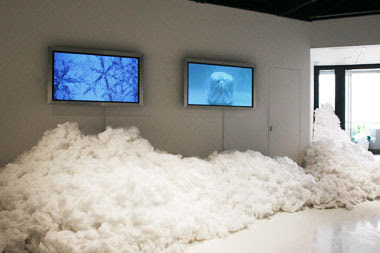 Starwars Wampa Rug: "Up until now your Starwars collection has been relegated to the walls and cabinets of your home. 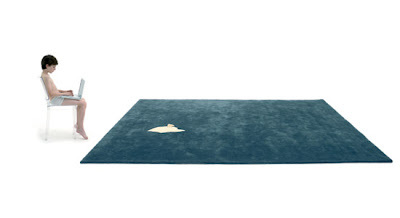 But now you can put some Starwars on your floor with this sweet rug." 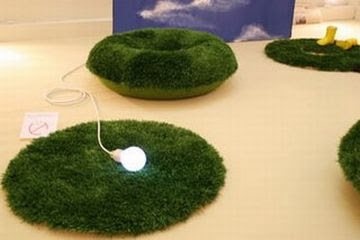 Mini Lawn: The Mini Lawn, created by Nguyen La Chanh, looks at getting the grass to your feet, and that too in your bathroom. 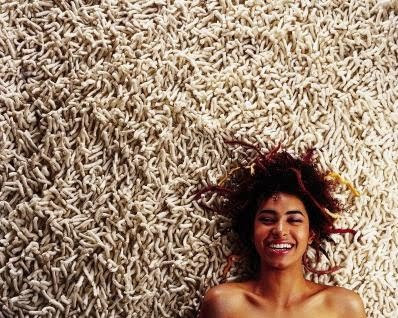 Lazyboneuk's Rug: "Just unroll it and there you have it, a novel soft surface with which to sit, sleep or picnic on, the choice is yours." 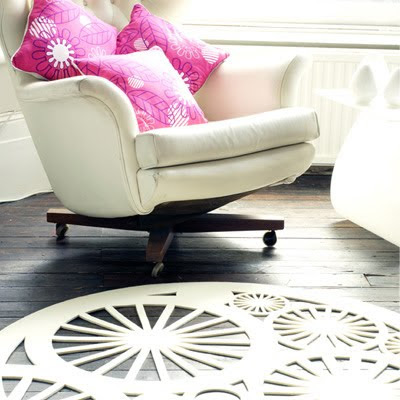 Leather Rugs: Designed by DSGN, it features 15 modern designs, all centered on the circle motif. 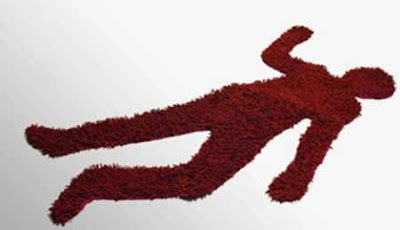 Great Outfit's Carpet: "Designed by Great Outfit, the linear carpet pictured here is one of the many modern interpretations of the traditional sheepskin rug by Great Outfit." 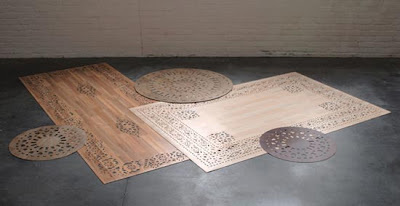 Geo Art Rugs from Nodusrug: Inspired by the cultures and crafts of six countries, "the Geo Art Rugs from Nodusrug boasts their own international flavor, in shapes that fit together like a puzzle in any combination, any number to suit any-sized space." 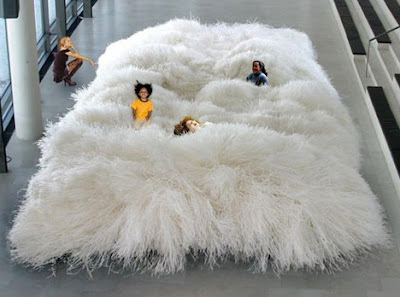 Flying Carpet by Nani Marquina: The three dimensional design allows one to use it as a carpet, a place to sit, stretch and relax. 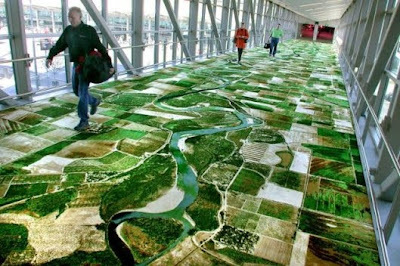 Alavi's Flying Carpet: "The artist had an aerial view of the Sacramento River woven into a carpet for the floor of a pedestrian bridge connecting the Sacramento International Airport terminal to the parking garage." Stella Felt Rug: The contemporary designs take on lace making, its made from felted 100% merino wool and will add a decorative talking point to any room. 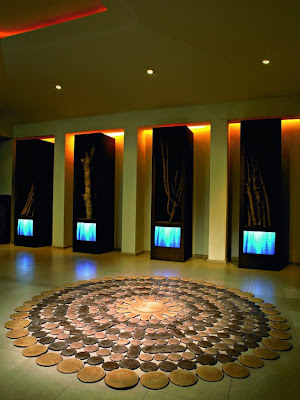 Wood Rugs: These are creation of designer Arzu Firuz, these appears to be made from wood. 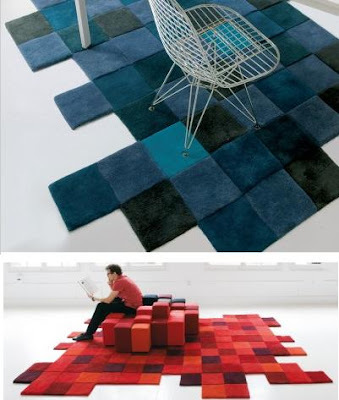 But actually these rugs are made from large sheets of imitation wood vinyl. 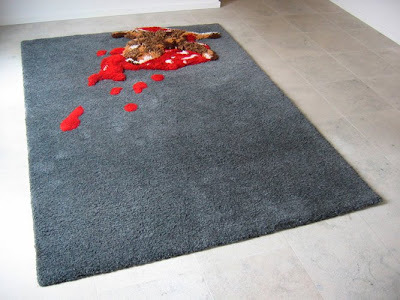 Dia Rugs: Designed by Magdalena Lubinska and Michal Kopaniszyn; DIA line of rugs is awarded prestigious Red Dot 2008 prize in the Red Dot Museum in Essen. 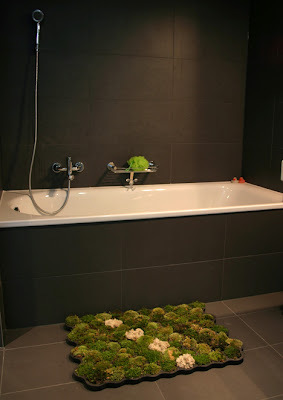 Indoor Lawn Rugs: The indoor lawn rugs are designed by PD Designs, Izumi Hamada and Hideo Hashimoto. 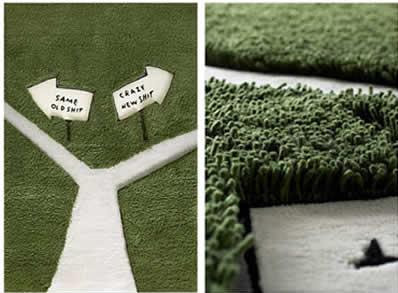 These beautifully crafted rugs from synthetic grass are grown on fabric mesh that consists of a reinforced plant fiber. 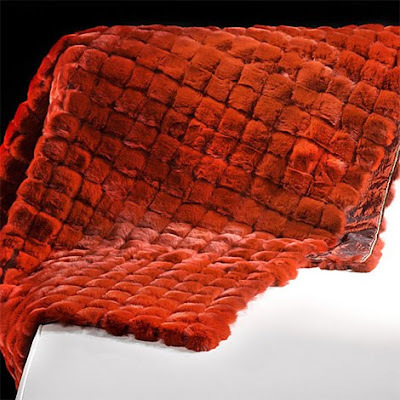 "They are meticulously woven with wool and applied to a cotton base, resulting in the marvelous piece of matting." Carpet Of Gloves: It's created with numerous vintage gloves that give it a visual effect. 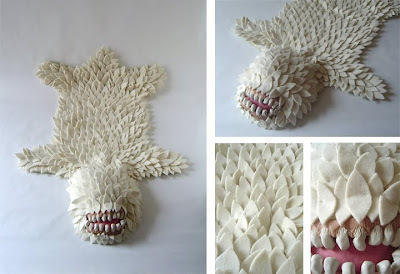 This artistic work can be used as a decorative piece on the wall or can be used as floor piece.